The Victoria Cross is the highest award for valour in the British armed forces, awarded for extreme bravery in the face of the enemy. Such is its nature that many awards are conferred posthumously, the recipients having been killed in the action that led to the award. For those recipients who survive the award it is of course a great honour. However it also redefines their lives for it carries with it a considerable responsibility. To live as the winner of the VC is to live a life that few of us can comprehend. Such a life was that of Hughie Edwards, Australia's most decorated serviceman of the second World War and a great Australian. Born to a working class family in Fremantle in 1914, young Hughie was forced to leave school at the age of 14 to assist his family. Without ever having aspired to being a pilot, he entered the Royal Australian Air Force (RAAF) almost by chance on a cadetship in 1935, thereby commencing an illustrious military career. In a little more than a year he had transferred to the Royal Air Force (RAF), the service in which he was to spend the rest of that career. A keen but not an especially good pilot, Hughie Edwards was to demonstrate that dedication, determination and personal valour can produce extraordinary results. He was also blessed with extraordinary good luck. He was fortunate to survive a pre-war training accident and then equally fortunate to be allowed to return to full flying duties early in the war. Very soon thereafter he was engaged in operations against Nazi Germany. 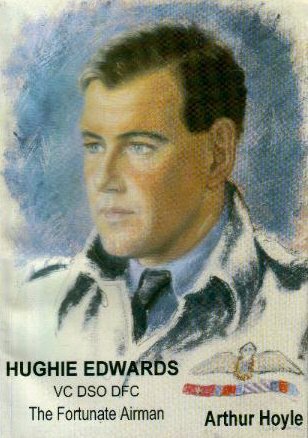 Such was the nature of the war and the rapid expansion of the RAF that, in May 1941, at 26 years of age and less than five years after being appointed a Pilot Officer in that service, Hughie Edwards was promoted to the rank of Wing Commander and appointed to command No. 105 Squadron operating Bristol Blenheims. Less than two months later he was awarded the Victoria Cross for planning and leading a daring, dangerous and highly successful low level raid on the heavily defended port of Bremen. Thus, just after his 27th birthday, a new life began for Hughie Edwards -- the life of a VC winner. He wore the honour well. He flew many more operations, mainly in Mosquito and Lancaster aircraft, often with more courage than good sense for he was never formally converted to the latter aircraft. He was also to distinguish himself in war service not only in the home country but also in Malta and South East Asia. He was to be awarded the Distinguished Service Order (DSO) and made an Officer of the Order of British Empire (OBE) for subsequent wartime service. His post-war career in the RAF saw him rise steadily to the rank of Air Commodore. In 1963, however, at the age of 49, he elected to retire from active service, return to Australia and enter the business world. He had a short period as Governor of his home state (1974-75) during which time he was knighted. He died in 1982. Hughie Edwards was a brave and determined man. A leader and an excellent commander in a wide variety of circumstances, he fulfilled the expectations that came from being honoured as a young man. Arthur Hoyle has captured this and many other aspects of this "fortunate airman", as he so rightly describes him in his biography of this great Australian. For me, the essence of the man is obtained in Hughie's response to a young pilot about to launch on his first operation. The young man remarked "Well I suppose this is a death or glory effort!" To which Edwards responded very gently "(Young man) there is no glory in it. That's what makes it worthwhile".